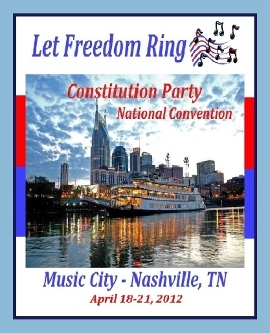 Constitution Party National Chairman, Jim Clymer, announced the 2012 National Convention of the Constitution Party which will be held April 18-21 in Nashville, Tennessee. "American voters who support limited, constitutional government, traditional American values, the protection of American jobs and preservation of individual liberty can take heart! They will not be limited to a difficult choice between Obama and Romney as the one likely to be the least threat to their life, liberty, property and other interests. The Constitution Party will be offering the Constitutional option in 2012," said Clymer. The venue for the Constitution Party National Convention will be the beautiful Sheraton Music City Hotel in Nashville, TN. The public is invited to attend, but registration is required and anyone wishing to do so should contact the Constitution Party national office at 717-390-1993 for further information. Registered guests will be admitted to all sessions and events, including the gala Saturday night banquet to be held after the conclusion of the Convention, but only delegates who are selected by the respective state party affiliate organizations will be allowed to vote. Among those seeking the Constitution Party Presidential Nomination is former Congressman Virgil Goode. Goode, who represented Virginia's 5th District from 1997 – 2009, was a member of the Liberty Caucus, chaired by Ron Paul. Known in the House of Representatives for his outspoken opposition to illegal immigration, his support for trade policies that protect the interests of American workers, for limited government and for cuts in spending along with a balanced budget, Goode joined the Constitution Party in May of 2009 and is now a member of its National Executive Committee. Other candidates seeking the Constitution Party Presidential nomination include Robby Carr Wells of North Carolina, a former NCAA Division 1 football coach at Savannah State University, Laurie Roth, of Washington, a talk show host and columnist and Susan Ducey, a constitutional activist from Kansas. The general session of the convention, which will include adoption of the 2012 Constitution Party National Platform and the selection of the party's presidential and vice-presidential nominees, is set for Friday, April 20, and Saturday, April 21, with the presidential nominee's acceptance speech scheduled for 1:30 P.M. Saturday, April 21. "To the millions of American voters--be they traditional Democrats who once believed that their party spoke for America's working people, honest, representative government and freedom or Republicans who used to believe that their party represented limited government, fiscal responsibility and individual liberty—who feel abandoned by their own political parties, I issue an invitation to find out about a new path for America-the Constitution Party (www.constitutionparty.com) and to join the campaign to Save America by supporting the Constitution Party Presidential ticket in 2012," concluded Clymer.